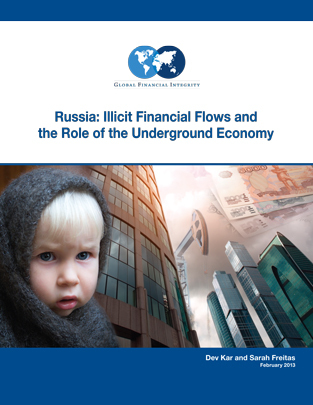 This February 2013 report from Global Financial Integrity, “Russia: Illicit Financial Flows and the Role of the Underground Economy,” finds that Russia lost at least US$211.5 billion in illicit outflows from 1994-2011. The report also estimates the size of the Russian underground economy, looks a the Russia-Cyprus money laundering relationship, analyzes connections between capital flight and the price of oil, and much more. The Russian economy lost at least US$211.5 billion in illicit financial outflows from 1994 to 2011. These outflows represent the proceeds of crime, corruption, and tax evasion, and have serious negative consequences for the Russian economy. 63.8% of these illicit financial outflows, or US$135 billion, left Russia through unrecorded wire transactions, as measured by GFI’s Hot Money Narrow (HMN) model. Furthermore, the report found $552.9 billion in illicit inflows to the Russian economy, primarily due to trade-based money laundering, also called trade misinvoicing. The report estimates the size of Russia’s underground economy–which includes, among other things, drug smuggling, arms trafficking, and human trafficking–at a massive 46% of GDP over the study period. The report’s broader measure of capital flight, CED+GER, found that Russia lost a staggering US$782.5 billion in outflows from 1994-2011. This methodology is broader than the more conservative HMN+GER methodology, and may include some licit private sector flows of capital. The price of oil was found to be a major driver of broader capital flight. The report finds that Cyprus, a small island nation with a GDP of just US$23 billion, is both the largest source and destination of Russian foreign direct investment (FDI) from 2009-2011. Cyprus sent US$128.8 billion into Russia in 2011 alone, more than 5 times Cyprus’s GDP. Dr. Kar notes that, “The recorded FDI positions merely reflect the round-tripping of prior illicit deposits from Russia into Cyprus,” making Cyprus a major money laundering machine for Russian criminals. Boost Russian customs enforcement by training officers in better detection of trade-based money laundering through intentional misinvoicing of trade. More closely monitor transactions between Russia and tax havens like Cyprus and Switzerland. Require that all Russian banks know meaningful beneficial ownership information of any account opened in their institution. Russia should use its influence to push for these and other transparency reforms at the upcoming G20 summit, which Russia will chair.